Car show season has been in full swing for a few months now for the entire country, and still has some life left before winter comes around. Fortunately for us here in the Sunshine State, we are able to have a year ’round car show season. 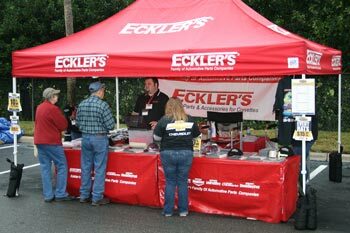 A huge perk of working for an automotive restoration parts company like Eckler’s is being able to attend many shows throughout the year, and meeting a huge amount of our customers and fellow “car guys.” For the most part, we attend at least one show a month, and often times more than that! We have a handful of employees here at Eckler’s who make up the show team, and we work hard at making the show experience the best we can for our and customers and event staff. The experiences we get to become a part of are nothing short of amazing. The car show world is filled with people who have “been there and done that”, as they say! There has not been a show that has gone by for me personally, that I haven’t learned something. Whether it be pertaining to a certain car or to an organization– something has always been taken from conversation. Being a vendor at the shows we attend, we basically have an all-access pass, and get to see the inner workings of some huge shows– often times meeting the masterminds behind them. For example, the Mecum Auction in Kissimmee, FL. This auction runs 10 days and rolls over 3000 cars across the auction block. Eckler’s alone handed out over 1600 catalogs at this one show. With that info alone, you can just imagine the amount of people in attendance. Our daily journey: Most show days consist of being out of town, so we are leaving the hotel generally no later than 7 am. Organizing the catalogs we have every morning is the main priority, followed by greeting folks after the show has opened. We spend a large portion of the day at the booth greeting folks, handling questions and customer concerns, and taking orders via our computer system. Customers really enjoy being able to talk with us one on one, and being able to tell us about their cars and parts. We do too! With today’s technology, customers are able to show us all the stages their cars have been through and currently are in with their smartphones and tablets, and it really is great getting to see all that! And if that isn’t enough, getting to see the cars in person at the shows are the best. We routinely get taken to the show field to look at our customer’s cars, and it truly is an honor. These show days usually last until 5 pm or later each day, and hardly ever are cut short– unless of course mother nature makes an appearance. We truly enjoy what we do, and are always looking forward to our next show on the schedule. We hope to see you soon at the next event!